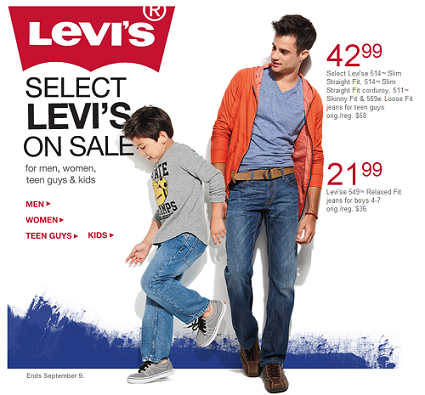 Levi's Jeans Sale at Kohl's! Jeans for Men Around $32! Levi’s Jeans Sale at Kohl’s! Jeans for Men Around $32! September 4, 2012 · by Zack Reyes · Post may contain affiliate links. See my disclosure policy here. Kohl's is having a sale on Levi's! They are normally $58 and are hard to get for a really good price. Until today! Get most pairs for men for just $32.24 with code GB2P8LM! Kid's jeans are also on sale for just $16.49 after code! Shop the kid's sale jeans here! You can also redeem any Kohl's cash online that you earned in the past couple of weeks.